I used to wonder why. I used to think how. Why would God punish like that? How could He do that? It made me perplexed so I put it away. You cannot successfully argue with God, anyway. Reading about His justice, His judgement, His righteous anger can make a human despair. Our already carnal minds cannot understand what is hard. And so some of us ignore the reality of His judgement and live in a fantasy. Others of us obsess about it, and then go crazy. But how could my God–so loving, so comforting--bring justice in like that? I didn’t want to go crazy, so I ignored it. I knew I couldn’t understand it, so I expelled it from my mind. While I accepted that His judgement and justice was right and holy—I couldn’t understand, so I never spent time thinking much about it. How could I? “He is no longer Counselor and Comrade. He is taken up with a point of view I know nothing about, and I am amazed at Him. At first, I was confident that I understood him, but now I am not so sure. I begin to realize there is a distance between Jesus Christ and me. And after this, instead of questioning God….I questioned myself. How dare I even think I have a right to consider any part of God unjust, too harsh? How could I even question Him, even for the tiniest second, when God’s own Son bore my sins and the sins of the world? My sin alone would take years to count, and yet He bore it along with yours, hers, his, ours! I sit in the comfort of my own body, working voice, breathing lungs, flowing blood and I have the gall to question Him! To ignore this part of Him! I cannot expel His terrible judgement and righteous anger from my mind because I don’t understand it. I cannot ignore God’s justice, because I can’t wrap my vulnerable heart around it. To ignore any part of God is to ignore Him altogether. He doesn’t stop being Love when He is being Just. He is not a God in parts. In His judgement, He is loving. In His love, He will judge. And I don’t get it, but I can’t ignore it just because I don’t understand it. After all, don’t I spend my time thinking about God’s love, and how I don’t understand it? Don’t I think about His grace without understanding it? Don’t I think about His mercy without understanding it? Don’t I think about His patience, His forgiveness, His power, His holiness, His righteousness all without understanding it? And all of these things pull tears from my eyes, and push my heart to its knees. And I worship—so full, so reverent, so in awe! Then, shouldn’t I think about His judgement and righteous anger without understanding it? Not in the reluctant acceptance that I’ve had before, but with the kind of acceptance that says I don’t understand this, but your justice, your judgement pushes me to my knees. And I am prodded to worship You because of this. I trust in God not with reluctance, but with awe. I can no longer ignore God’s justice when it does not make sense to me. I cannot fathom the amount of pain, distress, heartbreak, woe, despair, and darkness that pressed down on Jesus Christ when He took my sins and the sins of the world upon Himself. He was forsaken, betrayed, stabbed, punished—all for me, for you, for all of us. But Jesus rose again! He conquered the grave to give us a Hope, to give us a Future, to give us eternity with Him. We just have to believe in Him, and we are secured to God forever. And then we sit around, in the bodies He created, reluctant to trust that His judgement, His justice, His anger is righteous and holy. We question. We ignore. We turn our heads the other way and close our ears up tight. But we can’t do that anymore. 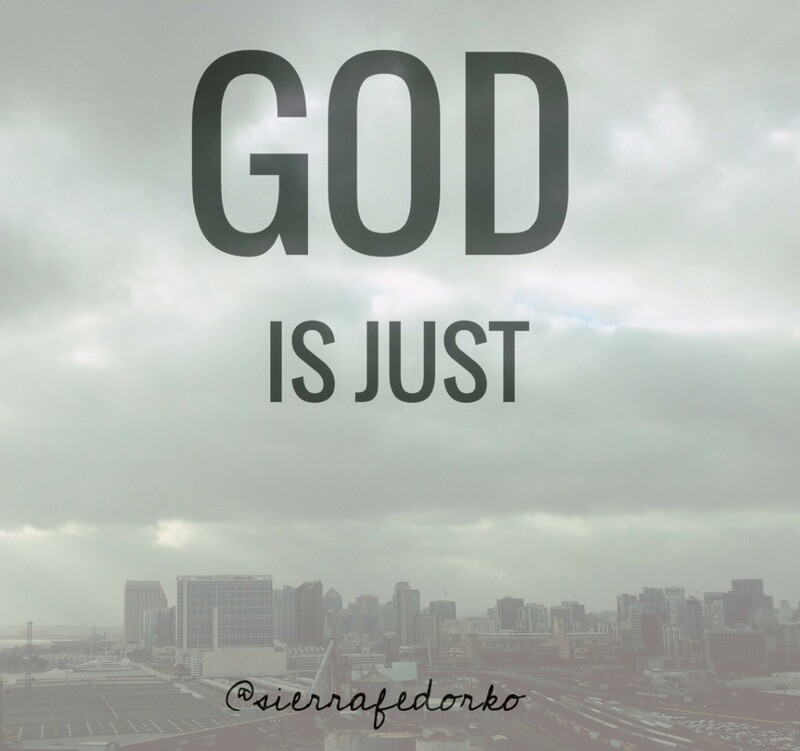 God is Just and He will judge, and we won’t understand His ways. But nevertheless, we cannot ignore it. Just as I cannot understand His love, I cannot understand His judgement. So–I fall to my knees in worship, in trust, in complete surrender to God. reverently, fully, amazed— I fall at His feet. Next > Moving in May! Well, this got me. Thanks for putting into words ideas that have never fully formed in my mind. This one is going to rattle around in my (rather tired) brain tonight and probably a good bit longer. Hmmm.